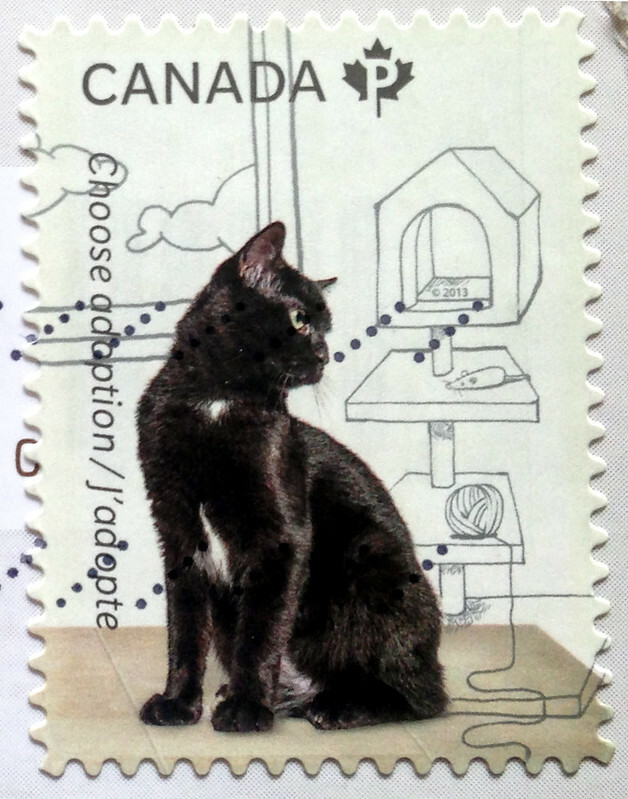 This lovely cat stamp came to me recently on a Postcrossing postcard from Canada. I can't recall what the postcard image was, and I neglected to photograph it at the time, but I was utterly charmed by this sweet kitty stamp. 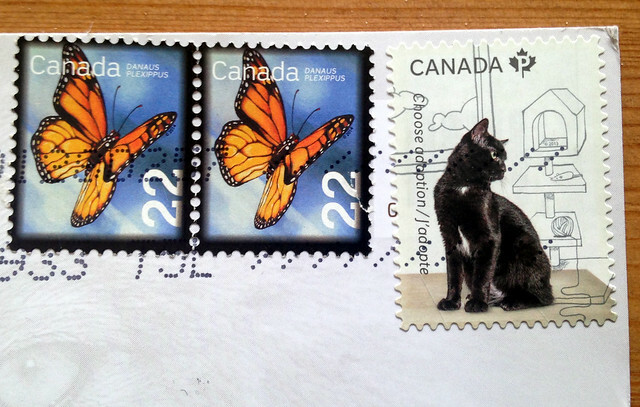 (US Postal Service, can we please get more stamps with cats on them??) It is from the 2013 Choose adoption / adopt a pet series, which shows photos of the animals surrounded by a line-drawing illustration of an imagined home life, once they are adopted. And look at the little kitty looking longingly at the cat furniture with a ball of string and a mouse toy! That is a great illustration of how I've loved and spoiled my own shelter-adopted kitties. Of course this is a subject very close to my own heart: my beloved kitties Stella, Oberon, and Soda (of blessed memory) all came from adoption via animal shelters. The postcard also came with these bright and cheery monarch butterfly stamps, too. I've said it many times before, but I'll say it again: the joy from Postcrossing isn't just the postcards (or the lovely connections with mail-loving people), it's also the postage stamp treats, too! Nice that they chose a black cat too. I've heard that those have a harder time getting adopted. I love how they imagined the life of the animals once adopted! Such a great idea. What a lovely stamp! I hope I will get one of those :) And I just love people who take cats from shelters (or any other animals). It's such a great thing to do. I have a black cat and I get always lots of questions regarding her blackness - what a silly thing to even make questions about. She is one of the greatest cats I have ever met. Great stamp, thanks for sharing. The minisheet containing 5 stamps is also very well done - and has a theme of animals leaving cages at a shelter. Also, the stamps are different sizes, just like the pets that come in all shapes. Have you seen all the stamps in person? If so, I envy you! Very neat to have the stamps different sizes, just like the animals. Maybe I'll get lucky and get some more of them in the mail sometime. No, sadly not that lucky. I just googled the set and dropped over the image from Canada post.